We know that empathy is a deeply important quality, which enables us to see the world as it looks through other, normally very different, eyes. But we may be unsure quite how to achieve this prized perspective. 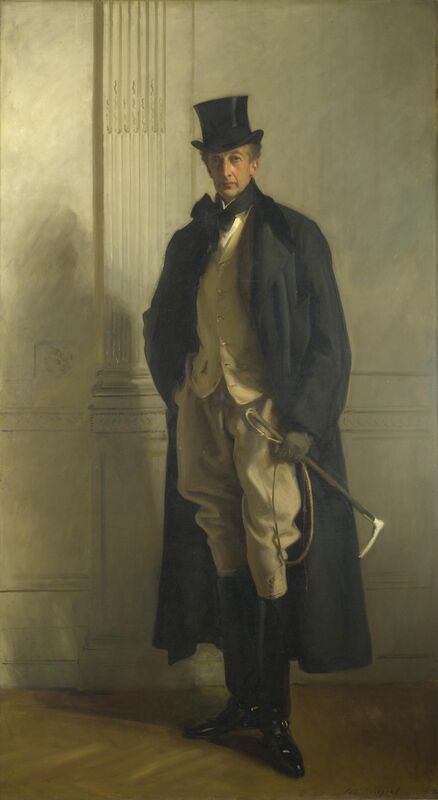 Imagine if we were, for example, asked to empathise with the formally dressed man, Lord Ribblesdale, staring at us from a portrait painted in 1902 by the American artist John Singer Sargent. Our first feeling is likely to be that the man looks utterly foreign to us, aristocratic, haughty and contemptuous, a figure to whom we have not the slightest connection or relationship. But the necessary manoeuvre is to try to draw on certain less obvious parts of our own experience. Insofar as each of us contains, in latent form, all of human life, there will inevitably be a small, currently recessive part of us that is in synch with the mindset we associate with a nineteenth century aristocrat. We might remember one day being on a busy train, jostled by groups of rowdy, perhaps drunk fellow passengers. The mood might not have lasted, but we might recognise for an instant in ourselves a potential to look rather sternly at others and suspect that in some ways, we might be rather better than other people. Or maybe there was a time, when we were eight and our parents were in the hallway about to go out to a formal party, and we tried on their smart coats or jackets and loved the feeling of authority that comes from certain kinds of formal clothing. We may generally have a very casual style and a democratic spirit, but locked away in our minds is the potential to grasp what might be appealing about looking grand and facing the world down with a stern demeanour. In trying to empathise with a lord, we’re seeking out and detecting an overlap of experience. We’re learning to recognise in a very different person an echo of our own intimate history. The person who lacks empathy isn’t so much selfish as generally not fully alive to the darker, less familiar, more weird recesses of themselves: the parts that are a range of things that they aren’t quite most of the time: the subordinate bits that are, in secret, a little aristocratic, surprisingly male or female, a thief or a child, when society expects them to be merely democratic, a man, a woman, a law abiding citizen or an adult. The unempathetic person isn’t narrowly refusing the challenge of entering into the mind of another person, they are wary of treading with sufficient imagination into their own consciousness. Behind the reserve of the unempathetic is a fear of running into troubling emotions. They may be confident yet don’t engage with memories of what it was like to stutter and be lost in the early years. They are successful but put aside the anguished apprehensions of rejection and failure that sometimes come in nightmares and would connect them with some of the people they walk contemptuously past in the streets. The long-married person harbours a promiscuous single self they pretend not to recognise. In the life of the quiet, serious individual there will have been moments, quickly forgotten, when they felt like throwing their books into the river and swearing at their teacher. We contain multitudes within us that we don’t dare to know. The opposite of empathy isn’t just thinking of yourself; it’s thinking of yourself in limited ways. An impressive feature of many legal systems is that someone who has been accused of a crime is entitled to have a skilled and sophisticated advocate argue their case before the judge and jury. The defence lawyer doesn’t need to like their client or think them innocent; their task isn’t to lie or deceive – but simply to construct the most favourable interpretation that the facts allow. Perhaps their client did indeed steal some money – but they felt very frightened, they didn’t mean to take quite so much, they’d just received some terrible news. The advocate searches in the surrounding circumstances for whatever mitigating factors there might be. The exercise has far wider applicability than a courtroom. Normally, we only ever get ‘hired’ – as it were – by ourselves. We are geniuses at representing our own side, at finding excuses and extenuating circumstances for what we have done or not done. And when it comes to others we typically act like the most aggressive and forensic prosecution; we in effect deny that someone could be at once good and have acted in a particular disheartening way. There could be another approach. The empathetic person makes it their business to adopt, in a wide variety of situations, the outlook of the other’s defence lawyer. They perform a hugely unfamiliar and often uncomfortable exercise: they do whatever is in their power to make their adversaries seem – for a time – reasonable and motivated by a comprehensible set of arguments. They hold back their normal instincts and try to apply a generous construction on the motives involved. Empathy needn’t mean we end up thinking the other person is saintly: we might still conclude that they are – for instance – not to be trusted, that they shouldn’t get the job or that we’d definitely better not marry them (just as in a court case the aim is to arrive at justice, not to acquit every defendant). But the deeper result is that we don’t merely see the other as a caricature. We understand how they came to be the way they are and recognise along the way, if we are frank, how many of their less than lovely qualities we share. It is only too easy to judge harshly when we are not deploying the correct degree of self-knowledge. One day, when we put the heating up higher than they would like, our partner may get very agitated. They may start to shout and we, just as quickly, may – with a degree of self-satisfaction – start to think of them as ‘insane’. It may be that we have never had this precise over-overwrought reaction to heating, but if we were correctly empathetic, we would be aware of the many occasions when we ourselves got surprisingly worked up about things that don’t seem very important to others. Truly empathetic people suspect that there are few kinds of madnesses of which they couldn’t, in certain circumstances, be capable – and are accordingly unself righteous. The more we bring our knowledge of ourselves to bear on others, the richer can be our insights into them. We start to know their deeper secrets and wishes, without asking. If we encounter someone who is always joking and seems very cheery, the empathetic person keeps in mind – because they know so well how they have been in certain of their own manic moods – that this ebullience is almost certainly in some way masking a sad and hurt aspect. They sense this because they can recall from their own experience moments when they adopted a brave and positive manner precisely when they felt close to collapse. Bringing our experience to bear matters immensely in commercial situations. What we call good service is, in essence, the fruit of empathy. When a waiter hovers at the table and asks repeatedly if everyone is having a nice time, it is simply because they have failed to factor in their own experience of irritation at overly ingratiating attention. The world of design is filled with absences of empathy. The planners of paths around parks – for instance – routinely forget how people actually walk. When they lay out their paths, they forget our impatience when faced with any slightly longer route, because they fail to consult with their own selves. They fail in their work because they cease to think of themselves as their own first customer. Empathy is often framed as a moral duty and interpreted as directly opposed to self-interest. In order to be more empathetic – the line goes – we have to abandon our own personal well-being and success. But this call to greater empathy more or less ensures its own failure. Our ingrained need to look after ourselves will reliably triumph. A more accurate understanding of empathy, however, doesn’t see it as opposed to our own interests. The reality is that we are very often hampered and derailed in our projects because we’re not empathetic enough, not sensitive enough to what’s going on for the people we’re trying to do things with, or to whom we aim to sell our services. Empathy is an essential resource for doing what we want more successfully, which captures a fundamental hope of civilisation: that being good should not be the enemy of prosperity.